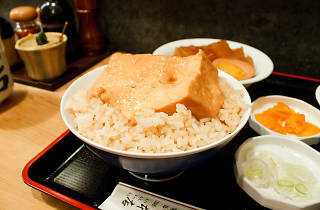 A Nihonbashi restaurant specialising in Kanto-style oden, Otako stews its ingredients in a dark stock that strikes a perfect balance between salty and sweet. 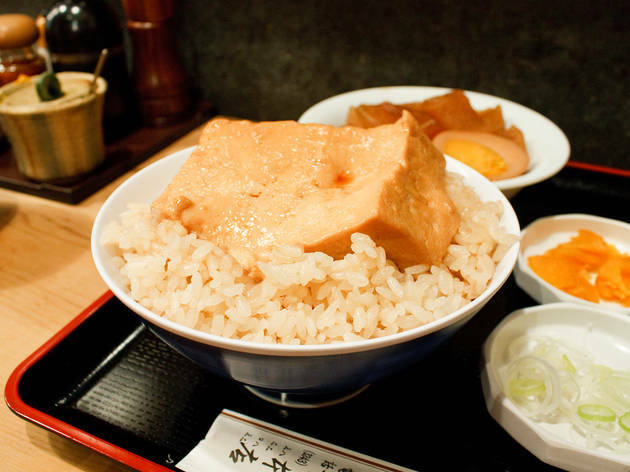 One of our favourite dishes is the tomeshi, a block of oden-style kinugoshi (silk bean curd) served on a bowl of chameshi (rice boiled in tea, seasoned with saké and soy sauce). They also serve an excellent – and filling – lunchtime set meal consisting of an oden-style soft-boiled egg with daikon, a bowl of miso soup with shijimi mussels, and a side salad, all for a very reasonable ¥670.